In my previous post I introduced cleaning up the Hello World web part that you get when you get the SPFx Client Side web part using Yeoman. In this post I’m going to create my base render web part and I’ll display some data fro SharePoint lists in my web part. I created a few more fields but within my posts I’m going to focus on these fields as they cover most of the common type of fields in SharePoint. To make my life a little bit easier I’m also adding an interface for a collections of bids. A couple of things to notice here. All the properties that end with a “?” postfix are optional fields. For my people field I’ve got a field matching my SharePoint name and I’m also using the Id property. I will be using the REST API to get to my data and for people fields and choice fields I’m getting the item IDs returned. These 2 methods will get data from my mock data and from SharePoint. Note that both methods return my data in the same format. Both return a Promise of the type Bids. In the MockBidTracking I start with importing my bid interface. Now I’m ready to create a new class. 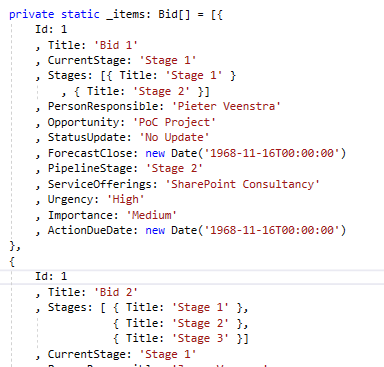 To read data from SharePoint I only need to call a REST API at : /_api/web/lists/GetByTitle(‘Bids’)/items and then return the JSON that is returned. _renderBids and the data will be rendered to my page. In my next post will look at creating forms within my client side web part. I hear you say: how do you now render the the data? ~~~~As there is a bit more to it than just normal html, I will address the details in a separate post. your effort is good, but reading your blog through code is damn difficult, you should change your blog post with syntax highlighting in the code like Markdown syntax or something that helps readers. Thanks for the feedback Luis, I’ve improved the formatting of this article a bit. I will look into using the Markdown options on WordPress.